Port of Spain (Agenzia Fides) - "No to the death penalty". This was stated by His Exc. Mgr. Joseph Everard Harris, C.S.Sp. Archbishop of Port of Spain, in a brief meeting with the press of Trinidad and Tobago, where the debate on the request by a Catholic priest to reinstate the death penalty for the violent criminals rages. Mgr. 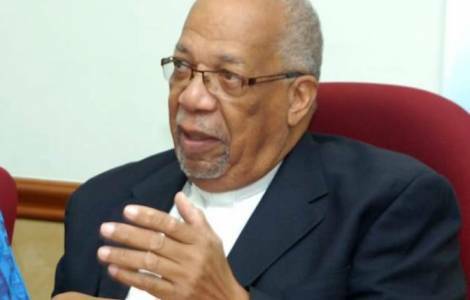 Harris recalled that two months ago, the Episcopal Conference of the Antilles issued a statement in which it opposes the use of capital punishment, and asked the governments of Trinidad and Tobago and Barbados to change their laws in this respect. Mgr. Harris quoted Pope Francis: "Indeed, nowadays the death penalty is unacceptable, however grave the crime of the convicted person. It is an offence to the inviolability of life and to the dignity of the human person; it likewise contradicts God’s plan for individuals and society, and his merciful justice". The Archbishop intervened in response to the pastor of St. Charles Borromeo, in Tunapuna, Fr. Ian Taylor, who during his homily on December 10 asked to reinstate the death penalty as punishment for the killing of Shannon Banfield during a robbery, an employee of the Republic Bank, a fact that shocked the Country.